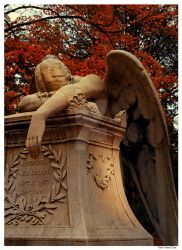 Angel of Grief is an 1894 sculpture by William Wetmore Story which serves as the grave stone of the artist and his wife at the Protestant Cemetery, Rome. 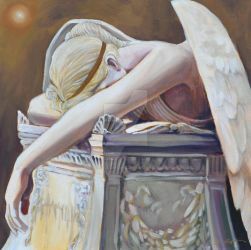 This is a gallery for images that are of or contain the Angel of Grief. Keep in mind the group guidelines. 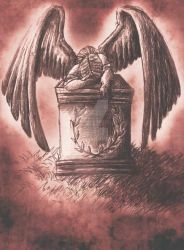 This group only showcases work that contain THE ANGEL OF GRIEF OR REPLICAS AND VARIATIONS OF IT. THAT'S IT. This club was mostly for me to find people who was a similar fascination with the William Wetmore Story sculpture and its replicas around the world. If you're the type of person who just joins random clubs they find and think they can post whatever the hell is in their gallery you will not last long, because if you submit anything that has NOTHING to do with the subject of the club everything you attempt to submit will me REJECTED. while taking photographs in a cemetery I came across this angel. I was so moved by it. Someone on DA recommended this site. What a beautiful collection. Thank you for the request. I guess I had no idea what I was painting until I came here. Thank you for the requests Much appreciated! Wow, I didn't even knew this group exists till now. "Submitting various things that have nothing to do with William Wetmore Story's monument." Let me guess, they were uploading the Weeping Angels from Doctor Who. Yes, and some user were just submitting random graveyard photos and angel statues.